Milk Protein Concentrate are highly nutritional products manufactured from high quality pasteurized milk by the process of ultra Filtration. 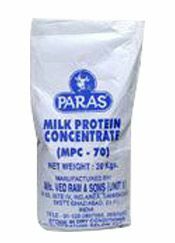 Milk Protein Concentrate are well known in the food and health industries. It is prepared from high quality pasteurized skimmed milk by the process of ultra filtration. MPC is packed in four ply paper bags with inner food grade poly liner. Product can be stored for 12 months from date of manufacture. Container loads are transported with inner plastic liner for protection, without pallets. The usual Capacity of a 20 feet container is 11MT and 40 feet container is 22MT.